The prophecy said that The Chosen One would save the duchy from the evil gryphons that were about to escape from behind the magical arch. Too bad they got the wrong guy. When cowardly young bard Terin Ostler is called before the Duke and told that he fits the description of the hero of the prophecy, he is certain there has been a grave mistake. When the Duke’s own men later try to kill him and he is forced to go into hiding, he realizes that it may be his own grave that is in question. Our young hero struggles to overcome his inexperience and limitations to figure out the meaning of the mysterious prophecy, accompanied by two squires who are torn between obeying the orders of the knight they have sworn to follow and doing what they believe is right. “The young bard, Terin Ostler, is astounded when two squires arrive to take him into the Duke’s presence – even more astounded when he learns that he is the one foretold in a prophecy to ensure the Arch remains sealed to imprison the evil Thessi within. The atmosphere of the quest that follows is heightened by intrigues and by Terin’s doubts about who tells the true account of the prophecy, since he is not allowed to read it. The action is lively when the two squires, Rendal and Darlissa, face repeated attacks to protect the timid bard – while he gradually grows in maturity, courage, and character. Terin’s sardonic observations bring the quest to life, and the suitably convoluted events of the final crisis close the prophecy and the story in fine style. The world of these humans, gryphons, elves, dwarves, and many other magic creatures is a constantly fascinating place for the lover of fantasy to discover within these pages. “What does work is Ventrella’s conception of an entirely new race. Yes the old fantasy stereotypes are all still here (goblins, elves, dwarves, etc.) but with the addition of the biata, a feathered people who refreshingly aren’t just a recycling of the aforementioned genre archetypes. This is good because in many ways the biata need to work, since the plot is based so heavily on their history. The book arrived at 5:30pm on a Friday night and I didn’t put it down until I was finished with it at 1am in the morning. Once the heroes were off on their adventure, the book quickly picked up pace and I couldn’t turn the pages fast enough to find out where they’d wind up next. One of the most refreshing things in this book is that the main character is not a battle ready individual, nor even a peasant who suddenly thrust into this fate becomes accustomed to it, learning how to wield weapons, killing his enemies as necessary and so on. He is a man (more of a boy) that rather runs away than fight, knows that he cannot defeat a trained warrior one on one and even blanches at the death of his foes. He is one of the more realistic and believable characters I have read in a book. 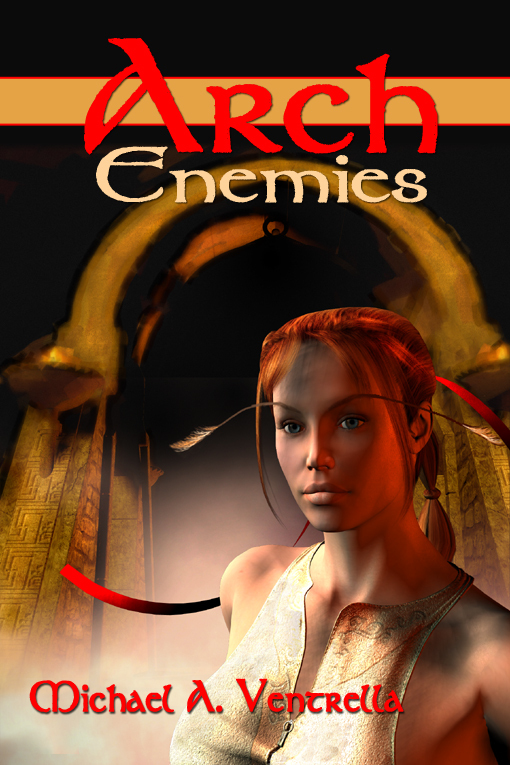 “Reading Arch Enemies was a joy and a treat. Bravo for bringing forward the biata race into the story and downplaying the other fantasy favorites that have had their share in the limelight. The situations Terin has to overcome in the story are things we can all relate to. He is pressured into doing a task that he would not normally do and quickly realizes he’s in way over his head. He is not the all-powerful champion and is constantly making errors in judgment. Yet, through simple acts of telling the truth and by conducting himself in small deeds of valor, he triumphs by showing us that bravery is not necessarily found in grand, epic measures. “Wild gryphons couldn’t make me stop reading once I finally got started. “The narrative rolls along smoothly, working well in the first person, and the language is simple, concise, and refreshingly bereft of the flowery prose which, in my opinion, is too often evident in fantasy fiction. The main characters are well developed and credible. One of my acid tests for any character in a work of fiction is whether they evoke an emotional response in me; and the main characters in this book definitely did. Overall, this was a very enjoyable and easy read. If, like me, you occasionally hanker after a simple piece of fantasy escapism, and can’t be bothered wading through the giant tomes put out by many modern day fantasy authors, this book is for you. “I purchased this book for my twelve-year-old granddaughter and she is the reader, not me. She received the book on a Saturday and didn’t seem to put it down until she had finished it by the end of the weekend. This is much the same behavior that I observed when she read the ‘Hunger Games’ series and the ‘Potter’ books. Not every book that she reads receives this kind of commitment. She reported that she liked the characters and felt that the story was compelling. However, she wished that the main character had made some different choices — that she would have done some things differently, – which during the conversation I interpreted as her close association with the character and, by extension, the author. “Terin is a likable character and you find yourself rooting for him to fulfill the prophecy. Terin’s self-effacing humor fits in with his character and makes him believable. Some of the reviews mention the presence of humor. Don’t be put off by this. The humor is occasional and not overwhelming.